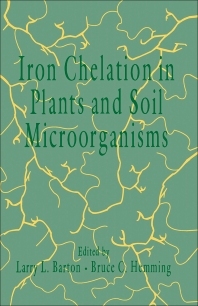 Iron Chelation in Plants and Soil Microorganisms provides an introduction to the basic biological processes of plants that require iron and those affected by iron deficiency. The book aims to stimulate research in the area of iron metabolism in plants and plant-associated microorganisms. The book is organized into three parts. Part I provides an overview of research methods used in the study of iron chelation relevant to plant biology. Key topics covered include microbial siderophores, phytosiderophores, and plant and microbial ferritins. Part II discusses the molecular approach to iron chelation, which includes molecular biology, enzymology, and iron uptake activities. Part III addresses various physiological and chemical characteristics of the iron stress response. This book was written for scientists involved in plant physiology, agronomy, phytopathology, plant control, and soil microbiology. It may also be of interest to those studying soil chemistry, plant-mineral relationships, horticulture, in vivo and in vitro iron measurements, and microbial ecology. In addition, the book can serve as reference for specialty courses and laboratories conducting research on iron nutrition in plants as well as individuals engaged in iron-related research.